Available $4400 a month for Jan 7th- July 15th 2019. 1910 colonial owned by top designer. Totally renovated w/ style and charm. Luxurious, beautifully appointed interiors for discriminating tenants. Top of the line chef's kitchen. Stone terrace, mature gardens, stonewalls. Just minutes to New Preston, Lake Waramaug and Washington. Featured in Ct Cottages & Gardens and House Beautiful. No drive-bys please. AVAILABLE Academic Year 2019-2020 $4,000/month This comfy, spacious cottage is part of a former camp directly on Twin Lakes. Four homes are spread around this park-like setting and share this idyllic retreat. This renovated, nicely furnished rental contains four bedrooms, a stone fireplace, renovated kitchen, tennis court and sandy beach, great views. Air conditioning and internet. Rowboat, kayaks, sailboat and shell are available for fall and springtime use. Both tennis courts and basketball court have been resurfaced. During winter, renters may cross country ski on open grounds. LUXURIOUS ACADEMIC YEAR RENTAL in Salisbury, Ct. Beautifully furnished and tastefully renovated 3 bedroom 3.5 bath home and Den with pullout queen and full bath, private office, attached garage, heated pool and large deck. Privately set and conveniently located near Berkshire School, Hotchkiss, Indian Mountain School and Salisbury Schools. Available September to June with some flexibility in the dates. $3,800/monthly academic year - Fabulous Lake Wononcopomuc Main house with 3 bedrooms and 3 full baths. The large living room boasts a wood burning fireplace and open floor plan to kitchen/dining room all overlooking the lake. The perfect lake house for family and friends to get together. Lovely large wrap around porch and lower level patio are ideal for outdoor relaxation. The lower level has a family room with pool table and easy walk out to quickly get out to the expansive lawn and down to the lake. The guest house has a bedroom with 2 twin beds and a queen bed in the open living room. Kitchen set up for light meals and privacy from the main house. An ideal space for guests. Luxury Lakeville Manor Apartment #5 - Available: 07/03/2019 - Listed on the National Register of Historic Places - Spacious, bright 3-4 Bedroom, 3.5 Bath apartment features hardwood floors throughout, large Entry Room with double coat closets, Living Room with built-in bookcase, professionally appliance'd Kitchen with separate large Dining area. Includes bedroom/office with built-in desk, in-unit laundry and one dedicated parking space. This unit is the entire 3rd floor complete with elevator. Close to Lakeville Lake and local restaurants and prep schools. A pristine home located in one of the most beautiful areas of Washington. Totally reconstructed well-equipped Antique Farmhouse bordering a large private pond. An expansive deck overlooks 5 level acres. Open floor plan, hardwood floors, living room with fireplace. There are two bedrooms and a full bath on the main level. The spacious master suite, large master bath and an office are on the second floor. The finished walk-out lower level is spacious and comfortable. Private location. A wonderful spot for long walks on a quiet country road. Minutes to town and just down the road from Waldingfield Farm one of the finest organic farms in the area. Access to Washington Town Beach at Lake Waramaug. Available July 15, 2019 Also available for July 15 thru Labor Day. Owner will consider pets by interview. "Elman House" is a light-filled open three bedroom shake contemporary on over 5 acres of private lush grounds with rock outcroppings, forest, meadow and garden space affording proximity to the Housatonic River, Twin Lakes, the Historic villages of Salisbury/Lakeville, Salisbury School and The Hotchkiss School all making it ideal for year-round or seasonal living offering a wide variety of fine dining, entertainment, and recreational activities. This open furnished light-filled private home is offered at $3,500 per month for Sept.-May and $10,000 per month for June-August. Pool and spa are additional fees. 4 Bedroom, 3 bath cape completely furnished and equipped. Steps to spring-fed lake access with boating, outstanding fishing, winter skating. Mohawk Mt Ski Area and hiking trails, including the famed Appalachian Trail minutes away. Eat-in kit with stainless steel appliances and expansive porch to enjoy tranquil summer evenings overlooking peaceful, distant views. Large, fireplaced living room and guest wing with 2 inviting bedrooms, den, and bath. Yet another bedroom with its own bath off the kitchen. Huge master bedroom suite with separate study/office area and good closet space. Lovely pastoral views on 5+ rural, private acres in an unbeatable country setting. Easy drive to enjoy shopping, historic Litchfield village, fine dining, Tanglewood, Jacob's Pillow, Yale School of Music, and a variety of other cultural and educational events. Within an easy commute to NYC. Call for your own personal showing. Available: 09/01/2019 - 05/15/2020 - Outstanding views of the Catskills from this 4 Bedroom Guest House in the much desired, private Great Elm section of Sharon. The Guest House has a private entrance with approximately 2500 square feet, 4 Bedrooms and 3 Full Baths. Private outdoor playground and tennis court for the tennis enthusiast located directly next to the Guest House. Should you prefer to be more social, head down to the community tennis court and paddle court. Just when you thought it couldn't get better, there is also a newly renovated community outdoor pool. All of which are located on the very private grounds of the Great Elm Estate. Quintessential New England home, Meticulously Updated Colonial On Over 5 Acres With Long Views over pasture and hillside. Located just Minutes From Washington Depot, The Grace Mayflower, Steep Rock Land Trust for great Hiking, the many shops and restaurants in the area. Part of Johnson Farm, the homes has renovated High End Kitchen + Baths with generous room sizes throughout. Ready To Move In! Annual Rental begins July 1, 2018. Built in 1850 this beautiful country home offers the charm of the old while providing all the necessary updates for today's busy family. First floor master suite, formal wood paneled dining room, large living room with wood burning fireplace and bright kitchen with stainless steel appliances and marble countertops. Upstairs, there is a guest bedroom suite and two additional bedrooms with hall bath. Surrounded by rolling horse fields and distant views enjoy sitting by the pool or dining on the fieldstone terrace. A breezeway makes a perfect mud room in winter or sun room in summer and leads to an attached two car garage. Minutes from town, Hotchkiss School and area restaurants. Available school year 2019-20 for $3,500 per month, annually for $4,800 per month and summer 2020 for $40,000. 3 bedroom, 2 1/2 bath with a private, open backyard and deck - Annual or School Year - Relax in our 100 year old newly renovated (2017) barn-turned-home. 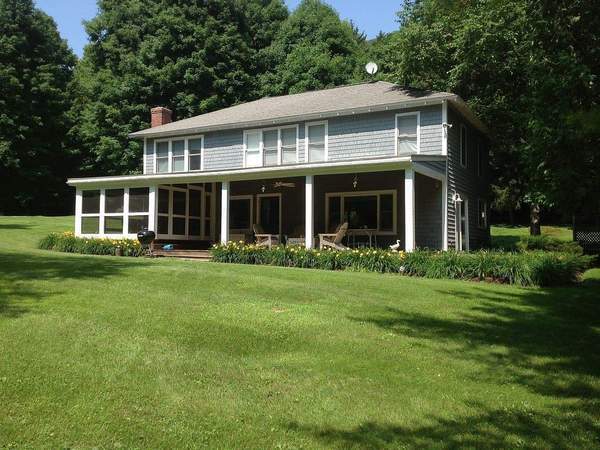 The house has an open floor plan and central AC which is ideal for a family, girls weekend, skiers, or 4-6 anglers looking to fly fish the Housatonic. Our outdoor deck, complete with seating and a brand new grill, overlooks our backyard and forest. A new 55 inch flat screen dons the living area, perfect for game day viewing. Two bedrooms upstairs are cozy and comfortable with en suite bathrooms and there is a smaller attached bedroom with 3 single beds. The showers, sinks and toilets are brand new. Activities in the area include, fly fishing, golf, skiing, farm markets, apple/berry picking, fine dinning, hiking, biking, tennis, Lime Rock Race Track and Skip Barber Racing School, just to name a few. This fabulous Penthouse unit on the third floor (with private elevator) is part of a stunning renovation of the former Litchfield Jail C 1812. Offering 2450+/- sq. ft. The 43x19 Great Room has views to the south and east of the town' s beautiful greens. Soaring beamed ceiling, wide board wood floors, original brick walls and an open kitchen that is well equipped. The master bedroom has its own bath complete with separate shower and claw foot tub. A den, private laundry , terrace and garage come with this sensational apartment. This mixed use building offers offices, two smaller apartments, a bakery, retail shop and a newly finished upscale restaurant. Perfect for your city apartment in the historic country village of Litchfield where you can walk to our delightful shops and restaurants. Off street parking with your own garage. Non-smoking, no pets, lease, credit check, references required. 10 minutes to RT 8 and 2 hours to NYC. Enjoy weekly summer concerts on the green from your air conditioned apartment. Tenant in residence and need notice to show. Should be vacant in March. Spend a year in this enchanting and storied antique farmhouse and fall in love with Litchfield County. Lovingly cared for by the owner, this home exudes positive energy and is a fantastic place to get away from it all and enjoy all the activities Litchfield County has to offer. This treasure offers plenty of cozy corners to read a book, a lovely dining room for summer dinner parties featuring locally grown provisions, and a quiet and sunny master bedroom for Sunday mornings with The Times. The owner's careful curation of this home is a delight and adds to the ambience. Located minutes to Tyler Lake, Woodridge Lake, The Litchfield Green, Sharon, and numerous dining and recreation options just 2 hours from Manhattan. Available: School Year 09/04/2019 - 05/23/2020 This 3 Bedroom, 2.5 Bath home on a quiet road just outside the village of Lakeville has been completely updated to blend historic charm with modern conveniences. Its quintessential New England style covered front porch opens to a bright Living Room which joins the home's indoor and outdoor living spaces. A Half Bath and Laundry closet off the Front Hall lead to a private First Floor Master Suite with separate Sitting Room/Office, Full Bath and French doors to the back Patio. The bright Eat-In Kitchen, completely renovated in 2017, opens to the back Screened Porch and Patio. Two additional Bedrooms, both with great closet space, and a Full Bath complete the upper level. Only a 2-minute walk to Lakeville's shops, restaurants, bike path, or Town Grove. Lakeville Lake (Grove) offers a sandy beach, boating, swimming, a recreation hall, paddle tennis and programs for all ages throughout the summer months. The village of Lakeville is in the heart of the Tri-State Region - 5 minutes to Millerton, NY or Salisbury, CT and less than 30 minutes to Great Barrington, MA and the Southern Berkshires. Beautiful views from this 2 bedroom, 2.5 bathroom house with 1 bedroom attached in-law apartment. Large living room with fireplace, formal dining room, eat in kitchen, screened porch and 2 car garage. The apartment has 1 bedroom, 1 bath, full kitchen, living room and terrace. STRIKING WINTER RENTAL WITH QUARRY Available: December 1, 2018 - May 18, 2019 - $3000 per month plus utilities This beautiful, sophisticated Contemporary home sits high on 23+ acres on Undermountain Road in Salisbury. Features include 4 Bedrooms, 3.5 Baths, a fabulous Kitchen, Library/Den, amazing Living Room with 2-story ceiling and fireplace, and a beautiful swimmable Quarry with Dock. One en-suite Bedroom is on the Main Floor. Fabulous location between NW Connecticut and the Berkshires! Academic year rental $3,000/month - STRIKING MIDCENTURY LAKE HOUSE by famous award-winning architect Peter Bohlin, designer of Apple's iconic glass cube NYC store, this property brings together a classic modern aesthetic with elegant design, relaxed comfort, and easy indoor-outdoor lake living. The home's entry gives way to a combined living room and dining room with fireplace, opening on to an expansive covered porch on one side and a delightful patio on the other, both offering lovely views of the lake. There are three bedrooms and a gracious bathroom above and a private guest bedroom with en suite bathroom below. Located at the end of a private road in the quaint New England village of Lakeville, Connecticut, this move-in ready house offers direct access to the water, a swim float, and boat mooring and is near the Town Grove with its beach, marina, playground, and picturesque community center and picnic grounds. The impeccably maintained retreat is just 20 minutes from the train to New York City, near the Hotchkiss, Salisbury and other independent schools, and close to the lively towns of Salisbury, CT, and Millerton, NY. Numerous restaurants, art galleries, boutiques, and ski areas are nearby. A unique midcentury house located on Connecticut's deepest lake in the beautiful sought-after Northwest Corner just two hours from New York - a rare opportunity to relax, unwind and enjoy this luxurious home ready for lakeside living! Available: 09/01/2019 - 05/21/2019 - Nestled between the Housatonic River and Salmon Kill Valley, this Brinton Hill country retreat is ideally located and surrounded by serenity. Enjoy big sky views and comfortable country living from the updated 3-Bedroom, 2.5 Bath farmhouse. A spacious Eat-In Kitchen sits central to the home's Living Room with fireplace, Dining Room, and Family Room. Three upper-level Bedrooms, including a Master Suite with private Balcony overlooking backyard views, provide space enough for everyone. Tastefully updated with close attention to preserving the charm of its quintessential farmhouse roots, this light-filled home is truly a gathering place that will immerse you in the heart of Litchfield County. Light-filled rooms and a picturesque setting, including a vegetable garden and firepit, culminate to provide serenity and the best of country living. Nearby Amenities include: Hotchkiss School, Salisbury School, Berkshire School, Lakeville Lake, Twin Lakes, Housatonic River, Appalachian Trail, Ski Butternut, Catamount Ski Area and Aerial Park, the villages of Sharon, CT; Millerton, NY; Great Barrington, MA.